Working Around ADHD is for you if you have ADHD/ADD and you want to gain greater control of your life. You take control by working around each obstacle, one at a time. 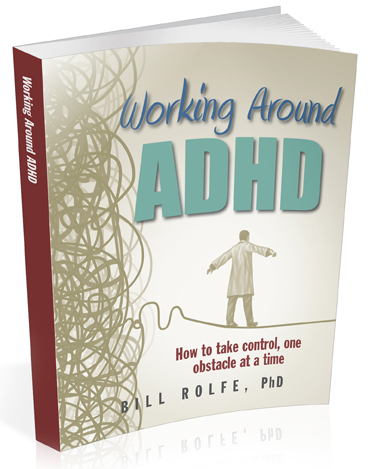 Working Around ADHD: How to take control, one obstacle at a time introduces 10 proven control factors that will show you: Where to look for obstacles Which obstacles to work around What workaround to use for each obstacle, & How to work around obstacles. Working Around ADHD is designed with the ADHD brain in mind. Many self-help books written for people with ADHD don’t seem to actually be designed for people with ADHD. There is usually too much information on each page. Dr. Bill, who has ADHD, completed an initial draft that was written like a typical text-driven book. He was shocked and dismayed to realize that his own book was not the kind of book that he would want to read. Too many words. He went back to the drawing board and condensed the information into its essence and rewrote the book. Working Around ADHD is designed to be easy on the mind. Information is byte sized. There are lots of visuals. There is humor, at time irreverent. There is color. The book challenges adults with ADHD to relax and reframe ADHD as, a series of obstacles to be worked around, one at a time. That is how you tame a 300 lb gorilla. “Working Around ADHD” is a book for adults with ADHD/ADD seeking a strategic approach for developing control. The book is organized around 10 proven control factors, and was designed with the ADHD brain in mind. 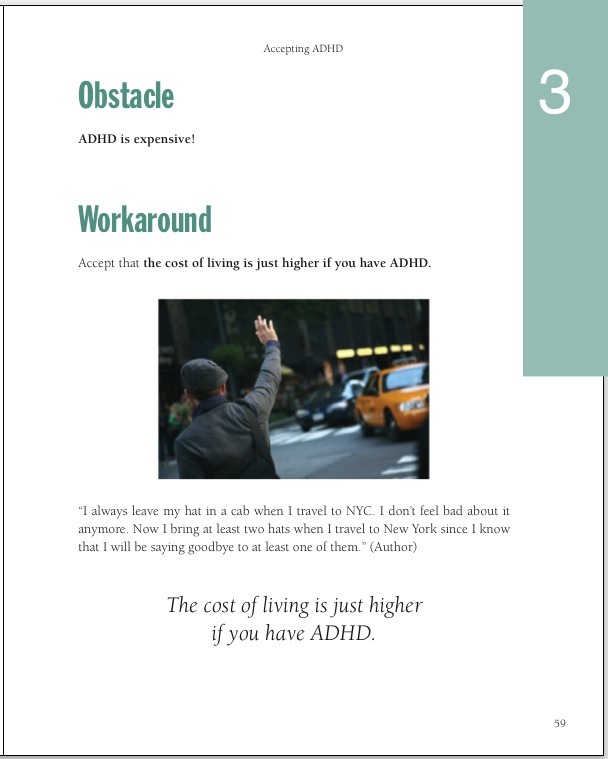 “Working around ADHD” is easy on the ADHD brain as it delivers substance in byte-sized digestible nuggets laced with colors, graphics, and a sprinkle of humor and irreverence.